The Royal Ballet is one of the great ballet companies of the world, a beacon in the cultural life of Britain and a driving force behind the development of ballet as an artform. Under the leadership of Director Kevin O'Hare, exceptional standards of artistry, creativity and stagecraft come together to produce supreme theatre. Since its foundation in 1931 by Dame Ninette de Valois, The Royal Ballet has developed great English choreographers and a celebrated British style of ballet. Today, attracted by its grand balletic tradition and illustrious heritage, a number of versatile dancers from all over the world join the Company, among whom are several Japanese dancers. 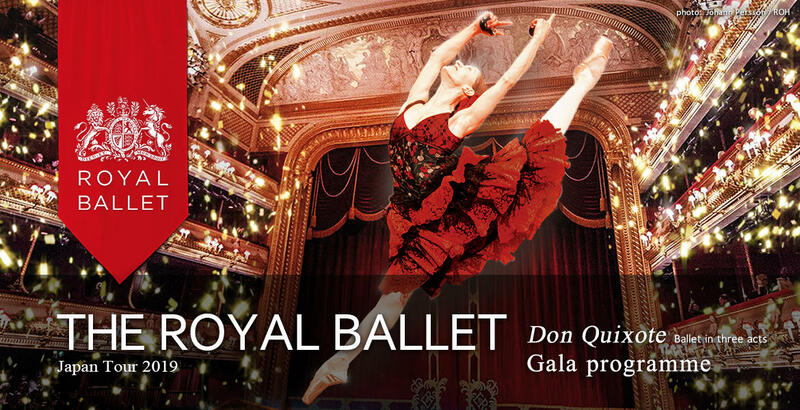 On this occasion, The Royal Ballet presents two programmes, Don Quixote and a gala programme. Carlos Acosta's effervescent production of Don Quixote, Marius Petipa's 19th-century classic, is packed with exhilarating choreography and virtuoso dancing, its warmth and charm matched by the vibrant designs by Tony Award-winner Tim Hatley. The gala programme will showcase the wonderful range of the Company's distinctive repertory and feature the outstanding talents of the Principal dancers on the Japan Tour. *The gala will feature the outstanding talents of The Royal Ballet and its Principal dancers. **Programmes and casting as of 14 December 2018 are subject to change. Changes in the programme or the cast do not entitle holders to return or exchange tickets. ●Children under 6 years old are not admitted to the auditorium. Full Tour Tickets for all the eight performances (in Category S only, \200,000) will be on sale at NBS WEB Ticket from Thursday 17 January 2019, 21:00 until Saturday 19 January 2019, 18:00. Enjoy below special benefits offered to the Full Tour Ticket holders. - Photo Session on Sat. 29 June with the Principal dancers who perform on the day. A professional photographer will do the shooting for each ticket holder, and a picture will be sent to each holder by post later. - A copy of program book with autographs of the Principal dancers will be handed to each ticket holder by the dancers on Sat. 29 June at the photo session. - Invitation to a dress rehearsal of Don Quixote on Fri. 21 June. Details will be announced shortly. Please note that there will also be a group of students as audience members. - Enjoy a complimentary drink on every performance day at the theater. - A free gift of The Royal Ballet's tour T-shirt. Enjoy a discount by purchasing the same number of tickets for both programs, Don Quixote and the gala, in the same seat category in one transaction. Tickets will be on sale at NBS WEB Ticket from Saturday 19 January 2019, 21:00 until Tuesday 22 January 2019, 18:00. Get a discount for course lunch at a French restaurant at InterContinental Yokohama Grand with the Special Weekend Tickets. You will get the discount by purchasing the same number of tickets for both Don Quixote (either on Sat. 22 or Sun. 23 June) and gala performance (either on Sat. 29 or Sun. 20 June). The name of the restaurant will be announced shortly. Tickets will be on sale at NBS WEB Ticket and NBS Ticket Center on Tuesday 19 February 2019, 10:00. Weekend Parent and Child Tickets (for children between 6 and 18 years old, elementary school students -senior high school students) will go on sale on Tuesday 19 January 2019, 10:00 at NBS WEB Ticket and NBS Ticket Center. Up to two child tickets per one parent ticket can be purchased. ¥4,000 tickets for young people aged between 6 and 25 go on sale on Friday 24 May 2019, 20:00 at NBS WEB Ticket. You must bring identity documents with proof of age to pick up your tickets at the venue on the performance day. Japan Performing Arts Foundation / Nikkei Inc.